When Dylann Roof, an admirer of Confederate iconography and racist ideology, murdered nine members of Emanuel African Methodist Episcopal Church in Charleston, South Carolina in 2015, the resulting calls to reconsider Confederate memorials coalesced a wide number of historical trends—some as old as the Civil War itself, and some as new as the Black Lives Matter movement. The historians in our roundtable all agreed that the present moment—whether long-incubated or a reaction to current events—questions the ability of Confederate monuments to stand as symbols of civic and social unity in a diverse democracy. Perhaps, in the wake of the Civil Rights movement and the ostensible color-blindness of American institutions, Confederate monuments might have continued to stand, unnoticed at least. But, as historian Nathan Connolly notes, national frustration with the status of race relations continues to gnaw at our civic life. He said, “the politics of diversity and inclusion have not kept there from being massive numbers of people killed by law enforcement officers; they have not dealt with the wealth gap; they have not dealt with the public housing, or the public health crises in so many part of the country. And, so, we need something more, we need something more explicit, we need something historically grounded.” That something being a memorial landscape that grapples more forthrightly with historical truths about race in history as we understand it, and Confederate monuments fail in that regard. Beyond the politics of race and representation in the era of Black Lives Matter, other historians have identified cultural and academic trends that have shaped our contemporary memory of the Confederacy, and in the process, undermined the power of Confederate memory in recent generations. Architectural historian Dell Upton, in his book What Can and Can’t Be Said, describes monument building in modern America. The war memorials of earlier generations—designed solely by cultural elites—used size, grandeur, and classical motifs to convey power. Modern memorials—following Maya Lin’s Vietnam Veterans Memorial—dwell on grief and loss as much as heroics and virtue. Further, modern memorials tend to be designed under the scrutiny of multiple constituencies, tell didactic stories with words rather than sculptural allusion, and emphasize connection with ordinary people by highlighting multiple figures at ground level. Modern memorials, then, may be reflective, wordy, and jumbled, but they meet the needs of more democratically inclined societies. Thomas Brown’s Civil War Canon chronicled the transformation and attenuation of Confederate memory in South Carolina. There, as in Virginia, wealthy women’s groups and society’s leading men all dictated genteel public memorialization in the early 20th Century. Wreath laying and solemn anniversary observances all in a reverent tone reflected the stylistic preferences of the elite white ruling class. Confederate memorialists after the 1960s, however, did so informed by the aftermath of the Vietnam War, and the absence of women (aside from the UDC), who had largely deserted Confederate commemoration. The men that remained linked Confederate memory not to Confederate leaders or their cause, but rather to common soldiers who fought in the Confederate army. Insisting on the honor of soldiers irrespective of the national cause was a particular response to the widespread condemnation of Vietnam veterans (and one that the original Lost Causers would not recognize). Doing so also narrowed the participants in, and audience for, Confederate memorial practice as it became more closely associated with hyper-masculine and hyper-militaristic exercises in cultural resentment. Of course, few academic historians would actually claim—as many Confederate memorialists now do—that common Confederate soldiers were unconcerned with their fledgling nation’s cause, or that they were a class of people utterly indifferent to and unconnected to slavery. The historical profession long ago freed itself from the thrall of the Lost Cause. Studies of the antebellum south in the 1970s and 1980s foregrounded slavery and proslavery politics as central to southern life and demonstrated how fundamentally race intertwined with society, religion, culture, economics, and politics. 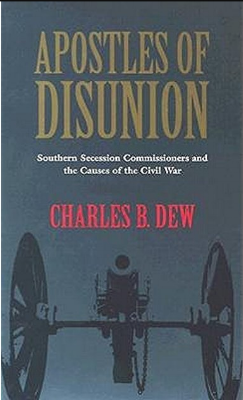 Of all the modern historical studies of the Confederacy, few have been as influential on the popular front as Charles Dew’s 2001 book, Apostles of Disunion. Dew examined the correspondence of commissioners dispatched by deep-south states to upper south states to convince the later to secede in the secession crisis of 1860-1861. Their appeals to their slaveholding brothers consistently and singularly focused on the threat of Lincoln to slavery and the need to protect it. At 168 pages, clearly written, and heavily documented, Apostles of Disunion has been assigned to almost every college classroom that even remotely covers the American Civil War. A generation of undergraduates has come to understand that yes, the Confederacy was motivated to secession to preserve slavery, and that we know so because they said so. So, a diverse public more conversant in Confederate history, the racial politics that lay at its heart, and less-wedded to seeing Confederate heroes as universal exemplars of virtue, has emerged at a moment when many Americans are frustrated with the progress of race relations in a post-Civil Rights world. These trends have positioned us to reconsider the place of Confederate monuments in our civic life today. As we have chronicled on the blog, people have created many meanings for the statues on Monument Avenue over time. Those meanings have gained cultural power and then faded over time. New, unexpected, events have given the statues new meaning. As we as a society continue to change, we will carry on adding new meaning to these monuments, and will always learn to see them in new lights.